Foreign Minister Heraldo Munoz vehemently denies that Chile's new left-of-center government will distance itself from - and in effect weaken - the Alliance of the Pacific, the bloc of pro-free market countries made up of Mexico, Colombia, Peru and Chile that many see as Latin America's best antidote to the region's populist craze. Before we get into whether we should take his word for it, let's see what he told me in a long interview when I asked him about press reports quoting Chilean President Michelle Bachelet as saying that she will "review" her country's participation in the Alliance of the Pacific. "No, no, we have not said that. That's what the media have said," Munoz told me. "What we have said is that we will continue being active in the Alliance of the Pacific, in a very proactive way, as long as it does not become a political-ideological bloc." He added, "We do not want the Alliance of the Pacific to be seen as a restrictive political bloc that is opposed to Atlantic coast countries. This is not a bloc of free market and efficient countries, versus statist and inefficient ones. We have to have respect toward Atlantic coast countries, and seek convergence within our diversity." 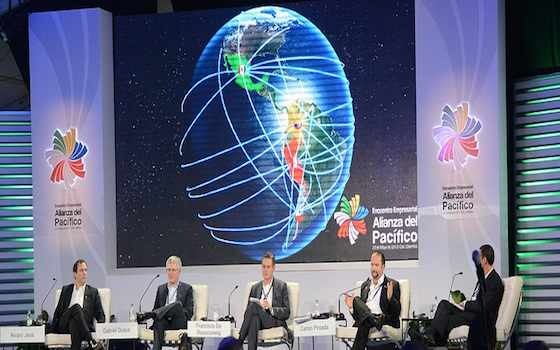 The Alliance of the Pacific trade bloc has thrived since its 2011 creation, while other Latin American trade blocs have been weakened by internal disputes. Among other things, Alliance of the Pacific member countries have reduced their customs duties, set up joint embassies and export promotion offices in Asia and Africa, and are setting up a joint stock market. Colombian President Juan Manuel Santos has described the Alliance as Latin America's "new economic and development engine." Such statements have irked Brazil, however. Either because Chile has huge business connections with Brazil and Argentina, or because Bachelet wants to distance herself from her conservative predecessor's enthusiastic support for the Alliance of the Pacific, Bachelet's first official visit this week was to Argentina. She is scheduled to travel to Brazil soon. Munoz told me that Chile wants to invite Brazil - Latin America's biggest economy - to play a role in the Alliance of the Pacific. When I asked him whether that's not a recipe for slowing down or killing the Alliance, considering that Brazilian officials have publicly expressed their dislike for the Pacific bloc, Munoz rejected that notion. He said that Chile will propose "gradual outreach and dialogue" measures to bring Brazil into the Alliance, such as agreements on the free movement of people, student exchanges and infrastructure projects along the borders. "All of these things can serve as building blocs toward bigger things," Munoz said. I argued that inviting Brazil could have the effect of slowing down the Alliance because a train moves at the speed of its slowest wagon. He responded that there is no need to slow down the Alliance because the Pacific trade bloc can perfectly well advance "at two speeds." Much like the European Union has some countries that have adopted the Euro as their currency and others that have not, the Alliance of the Pacific can also have two different tracks, he said. "I can assure you that the Alliance is very much within our radar," Munoz said. "But Chile wants to be a bridge country, so that Atlantic coast countries can move their goods to the Pacific through our ports. To do that, we need to improve our ties with the Atlantic." My opinion: The Bachelet government is right in seeking better ties with Brazil and Argentina, which are vital to its economy. But I wonder whether it should do it at the expense of trying to strip the Alliance off its political aura of Latin America's "engine of economic growth," because its "regional brand" could be its best carrot to attract foreign investors. Much like the Czech Republic and other small countries in Europe, it's much easier for Chile to sell itself as a good place to invest as part of a larger group of free market economies - "invest in Chile, and you can export to bigger members of the Alliance of the Pacific" - than to do it alone. At a time when world investors are getting increasingly wary or emerging markets, I wonder whether Chile should not be - at least tacitly - promoting the Alliance of the Pacific's image as the dream team of Latin America's star economies, while trying to improve ties with Brazil through bilateral agreements. "The Future of Latin America's 'Growth Engine'"